A cash cow is a “Fantastic Beast”, right? 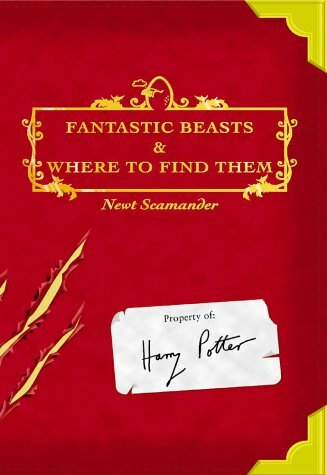 It’s been reported recently that JK Rowling is to write a screenplay called Fantastic Beasts and Where to Find Them, based in the Harry Potter universe around the young wizard’s text book of the same name, and, presumably, the fictional text book author’s adventures in researching for it. You can read the book if you want – along with Quiddich Through the Ages, JK Rowling write it as a mini companion to raise money for charity Comic Relief. I’m not sure how I feel about this. From the Warner Bros side of things, it’s clearly in reaction to the huge wads of cash that eight Harry Potter movies made and Universal Studio’s theme park The Wizarding World of Harry Potter has also made, not to mention all the merchandise, costumes, stationery and so forth that has stemmed from the franchise. And Warner Bros are a business, and their job is to make money by making movies, so I can understand their motives there and can’t really fault them. But I can’t help but wonder if JK Rowling is up to screenwriting. Now, she might have been working on her screenwriting skills for the last two years, looking for just this sort of opportunity to try new things, I don’t know. But the thing is, screenwriting requires a whole different set of skills from novel writing. You know how I went on about how your book is not a movie? Yeah, well. Books and movies have different methods of pacing, different storytelling techniques, different focuses. Rowling has shown she can manage books perfectly well enough – even writing under a pseudonym, The Cuckoo’s Calling sold entirely respectably for an apparent debut from a previously unknown author, before exploding into bestseller lists when the truth was revealed. But does she have the skillset to write for screen? And if she doesn’t, will Warner Bros put another writer on it, a professional screenwriter, to fix it all up and make it work where Rowling hasn’t, and still name her as writer because it looks really good on a title card? Quite possibly. In truth, though, she doesn’t need to write it. Anyone with some screenwriting experience could write the movie, and because it’s Potterverse and endorsed by Rowling and made with the kinds of budgets and special effects Warner Bros has access to, it’d do well at the box office. So what this says to me is that Rowling really wants a shot at writing a screenplay, and this is her best opportunity because Warner Bros will give her loads of support because they know they’ll make money from something in the Potterverse. For Warner Bros this whole thing could just be another squeeze of the cash cow’s udders. For Rowling I think it’s a new challenge she wants to face, a new style and approach to writing she wants to try out – and an opportunity to keep inventing in a world she clearly loves. She may not be up to screenwriting, but I think people can help her. Exactly; she’s in the best possible position to give this a go because of the support Warner Bros will be tripping over itself to provide.